Clients were wanting an organic-looking wind-sheltered courtyard area that blended into the stark surrounding Australian landscape. 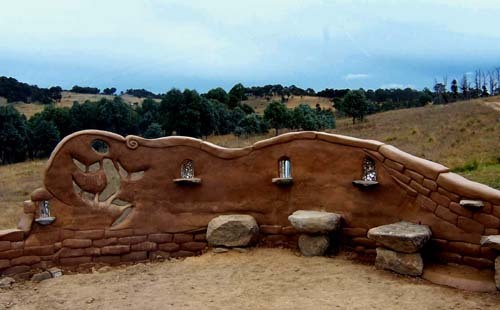 A curved, adobe wall was created on the perimetre of the courtyard area featuring rocks gathered from the farm that also could be used as seating. Artistic elements were incorporated including a stylised silhouette of the client's son that also acted as a window into the surrounding landscape. Candle niches completed the design.